Sunlight and artificial lighting have 3 wavelengths: UVA, UVB, and UVC. UVA is the visible wavelength of light, and in reptiles is responsible for inducing "normal behavior" such as feeding, climbing, mating, etc. In other words, it is responsible for the "physiological well being" of reptiles. Zoos have experimented with UVA bulbs for years (ie: BLB black lights) and found that exposure to high levels of UVA lighting for 2 hours daily induced mating in many species of lizards. UVB is the non-visible wavelength. UVB in humans is what gives us a suntan. In reptiles UVB facilitates the synthesis of vitamin D3, which allows reptiles to process calcium in their systems thus preventing or reversing metabolic bone diseases. UVC is the wavelength used for Ultraviolet Sterilizers, which kill harmful bacteria. This wavelength is very dangerous to all animals because it can damage DNA. Although all reptiles and amphibians benefit from UVA, snakes derive their D3 from the liver of the prey they eat (mice, rats, etc). Amphibians do not seem to need UVB lighting. All lizards, turtles, and tortoises must have UVB lighting either from natural sunlight or from a good quality UVB fluorescent bulb. 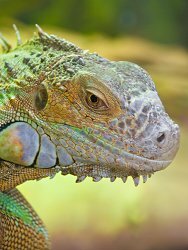 Green Iguanas will start to show signs of metabolic bone disease at 6 months of age if not supplied with ample UVB lighting. Color Rendering Index: That is the effect that a light source has upon the colors of an object. The sun has a C.R.I. of 100 and is the standard by which all artificial lighting is measured. Any artificial light source with a C.R.I. above 90 is excellent. Unfortunately, in artificial lighting, if you have high levels of UVA and UVB, you will sacrifice some of the C.R.I. Color Temperature: Temperature is the description of the warmth or coolness of a light source. Warmer light is red in appearance and graduates to orange, yellow, white and then blue-white to deeper colors of blue. The sun rises at about 1,800 Kelvin and changes from red to orange to yellow to white as it climbs to over 5,000 kelvin at noon and then goes right back down the scale as it sets. The preferred kelvin rating for artificial reptile lighting is 5,000 to 5,500 kelvin.